Puerto Rican boxer McJoe Arroyo wins the vacant IBF World super flyweight title after beating the Filipino boxer Arthur Villanueva. 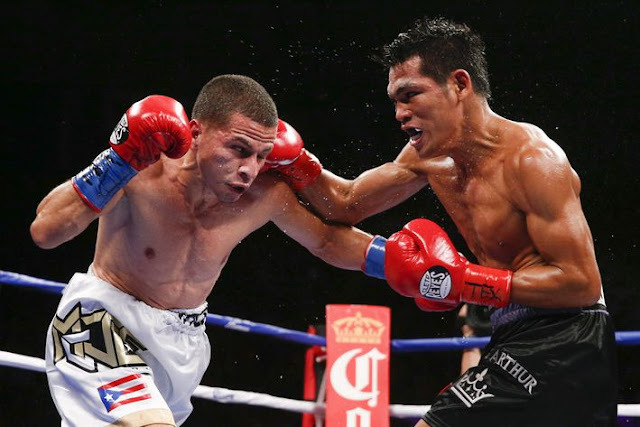 Fight happened at Don Haskins Convention Center, El Paso, Texas on July 18, 2015. It was a boring fight but Villanueva was the aggressor and throws more punches while Arroyo was the most accurate. Villanueva was looking impressive in the fight and Arroyo is just throwing jabs and counter punches. Also in the 6th round Villanueva was deducted 1 point for the headbutt. Three judges respectively scores 91-98, 91-98, and 92-97 all for the Puerto Rican boxer. The scores was too far from what people saw. It should be a close fight and should be dominated by the Filipino. After the decision announced, the audience booed Arroyo for winning the IBF belt. Another controversial decision in the sport of boxing, most of the unofficial scorecard around the internet shows that Villanueva was dominated. Meanwhile, in the main event, Julio Cesar Chavez Jr wins via UD against Marcos Reyes.